Mein Kampf (“My Struggle”) is the autobiography and political philosophy of the 20th century’s most despicable human being. 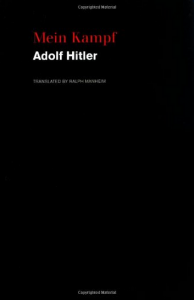 Written while in prison for his failed Munich revolution of November 1923, Hitler produced the first volume in 1925 and the second in 1926. I am sure that reading his words does not compare to observing his powerful rhetoric, which most of us have only seen and heard on scratchy black and white film. I read the first volume with my usual pencil, marking both the pages and the front flap. Although I am very interested in WWII history, especially the European Theater, I am reading Mein Kampf with the purpose of comparing attitudes and actions of that time to ours (realizing that we probably compare more to Marx’s Das Kapital). Hitler, of course, had a special hatred for Jews and blamed all of society’s failures on them and their control of the economy. He blamed the rich (Jews) for oppressing the poor and the (Jewish) media for being in league with the status-quo politicians. He advocated necessary (even patriotic) violence as a noble display of national pride.